Svechnikov, a Russian scoring winger, had said earlier in the series that Ovechkin is someone he looked up to growing up. 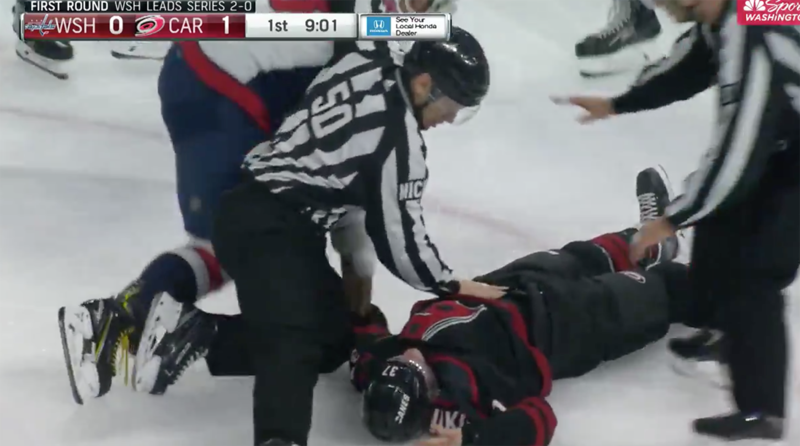 Before Caps' captain Alex Ovechkin dropped dropped the mitts prior to Monday's tilt with Hurricanes rookie Andrei Svechnikov, where the Capitals captain knocked out the Hurricanes rookie, it had been nine years since he'd been penalized for a fight. Ovechkin caught Svechnikov with his right fist, sending the back of his head crashing hard into the ice. Svechnikov remained down on the ice after the bout and then had to be helped off to the locker room. It was the first-ever National Hockey League fight for Svechnikov, who was selected second overall by the Hurricanes in 2018. He won't return to the game due to an upper-body injury, according to the Hurricanes' public relations staff. Washington entered the evening up 2-0 in the series. The pair met last spring ahead of the NHL's entry draft and Ovechkin wished the aspiring NHLer luck.